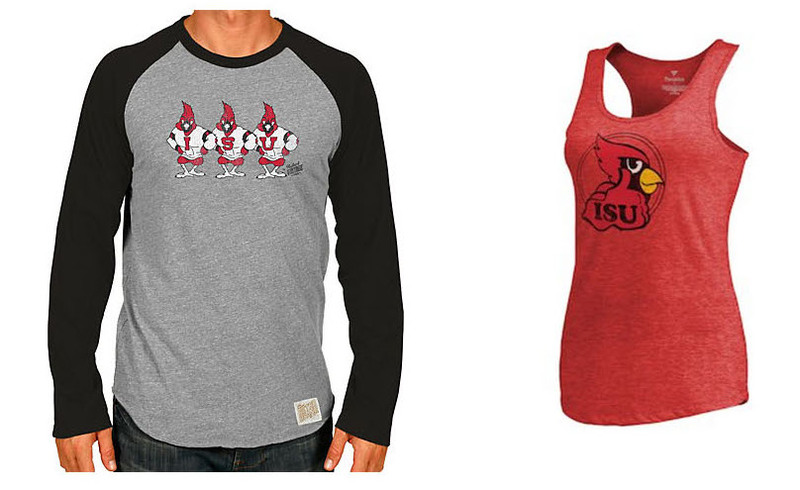 Get your vintage Redbird gear today with the new College Vault line of apparel with throwback ISU logos! With Homecoming week upon us, an air of nostalgia and reminiscing has fallen upon the campus of Illinois State University. Alumni have made their plans to come back to celebrate their Redbird roots and students, faculty, and staff are ready to partake in a week full of events. Vintage Redbird apparel available from the Alamo II (left) and the College Vault online shop (right). What more could a Redbird want? Throwback Illinois State fashions complete with retro logos—that’s what! Illinois State University is excited to announce the launch of the College Vault line of Redbird apparel, featuring official ISU logos from over the years. If you’re a Redbird who grew up with thumbs-up Reggie and I-State, you won’t want to miss out on the chance to show off your old-school ISU pride. And even if you’ve never seen these retro logos, you won’t want to be without the College Vault vintage take on modern style. This launch of the vintage line of apparel will feature six of Illinois State’s former logos, including the running basketball Reggie of the 1980s and the interlocking ISU logo of the 1960s. Get your vintage Redbird apparel today at the Alamo II, Shop.GoRedbirds.com, and the online College Vault shop.